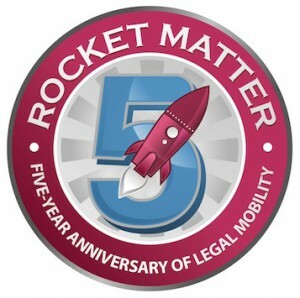 Rocket Matter, the world’s best law office management program, has announced that in celebration of its fifth anniversary, it is kicking off a year-long celebration and giving away iPads, Android Tablets, and Kindle Fire devices to celebrate the occasion and their commitment to mobile lawyering. I remember the first time I ever spoke with Rocket Matter’s CEO Larry Port back in the Fall of 2007, when he called me to discuss an upcoming legal software product that he claimed would revolutionize the industry. He asked if I would be interested in checking it out for my firm, and I agreed. When Rocket Matter launched in late February 2008, we were on board from day one, and we’ve been with them ever since. It’s been a great ride so far, and we’re just getting started. We’re committed to making the lives of attorneys a whole lot easier, and the best way to do that is to keep improving the product and get more mobile devices into their hands. Our Five-Year Celebration of Legal Mobility aims to do just that. If you haven’t taken a look at Rocket Matter yet (or recently), take a few minutes to do so. It has really improved our efficiency and as a result made us better lawyers, and it can do the same for your firm too. You can also get more information about their tablet giveaways can be found on their website. Again, happy anniversary from The Mac Lawyer to my friends at Rocket Matter, and may you have many many more years of success!